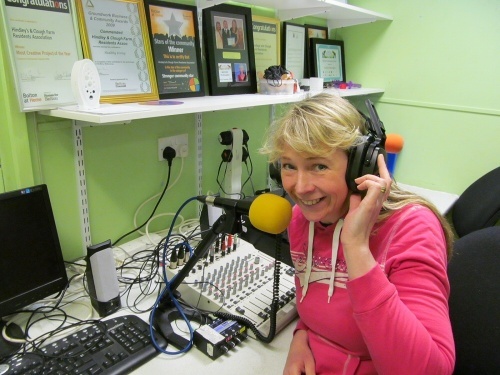 Starting in 2006, the annual, award-winning community radio event that is Washacre FM not only reaches the heart of the community but gets them involved, and has is become a highlight of the Westhoughton calendar. Broadcasting from the John Holt Youth and Community Centre (BL5 2NR), the broadcast is the result of much planning, organising, producing and 'making it happen'… with a mix of music, local content and features, fun stuff, drama, competitions and generally anything that will get local residents involved. A major undertaking, local people are given the chance to be presenters, engineers or may help in a variety of ways to bring this broadcasting feast to the airways. Obtaining a special broadcast licence and reaching out across Westhoughton and beyond, it is a chance for the local community to shine and do something a bit different! The broadcast began as a project between HACFRA (Hindleys and Clough Farm Residents Association) and Bolton at Home, with support of DBBC (Diversity in Barrier-Breaking Communications) who helped with initial training and technical expertise, and has gone from strength to strength reaching out to all of Westhoughton - and beyond. Overseen by Station Manager, Doug Cunliffe, and managed by a team of hardworking and enthusiastic residents and volunteers, the broadcast seems to get better and better. With each year and another successful broadcast, Washacre FM is able to introduce new presenters, have a mix of music, local interest, chat, interviews, supplementary pre-recorded pieces, humour and 'Keawyed' banter; a particular success being the 2014 radio play, which brought two Westhoughton community groups together - Washacre FM and the Westhoughton Methodist ADS. The broadcast comes to its conclusion with the final day presenter send-offs and open mic sessions, of course, the celebratory Showcase Day - a great buzz with many highlights. All thanks to the tireless work behind the scenes from HACRFA, presenters, technicians and volunteers. The transistors barely cooled, talk and planning begins for the next broadcast and new challenges ahead! Unfortunately, due to unforeseen circumstances this year's broadcast, and what would have been the 10th anniversary, will not take place. However, it is hoped to run some training sessions at the John Holt Centre for would-be radio presenters and engineers. The popular Showcase Day will still take place in and around the centre with community involvement, family fun and entertainment. Washacre FM will return in 2017. New volunteers are most welcome, both for on-mic work and behind the scenes. Are you a 'future broadcast star?' It's challenging, fun, and a chance to develop new skills and work as part of the broadcast team, reaching out into the local community. Washacre FM 2013 | Washacre FM 2012. WashacreFM Facebook Group | @WashacreFM / #washacrefm. Continuing group development and information sharing, at venues around Westhoughton. Bolton Council and Bolton College consulting with WCN and other partners to reintroduce Adult Learning Provision to Westhoughton. A survey is launched, with follow-up events planned. Details | Online Survey | Download. Starting Friday 5th Apr (7:30pm), monthly themed music concerts at Blackrod Community Centre. Sun 14 Apr, Pyramid Warrington, Masterclass and Concert. 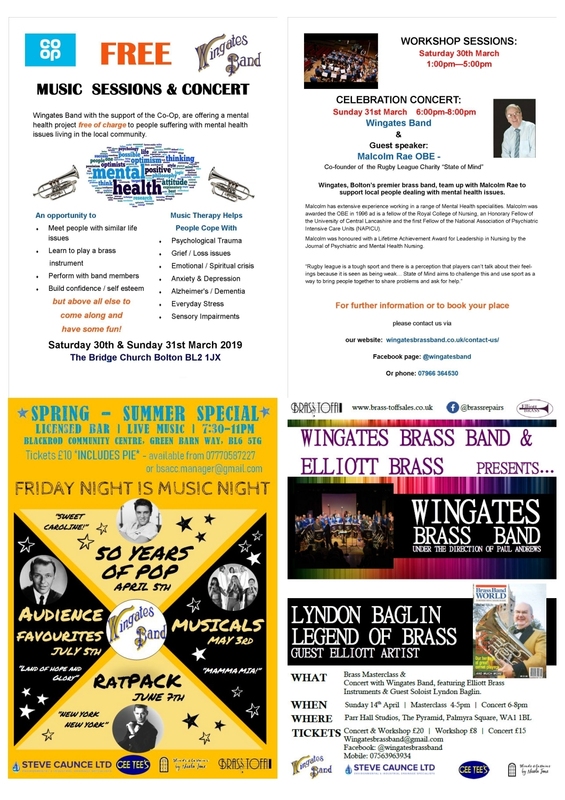 News and information about the brass band and upcoming concerts, and details of Supporters Club - info. Beginning Ash Wednesday (6th March), Lent and Easter are busy times for our community Churches. There is a 'Lent Course' at St. John's. Exhibitions at St. Bart's (1st-5th April). Services open to all throughout period. Easter Weekend - 19th/21st April. Informal, confidential drop-ins held by Pcsos, chance to discuss local issues, seek advice on security & crime prevention. Programme. Group activities and events; available for hire for community groups - also parties. 'Grub tub' available for Foodbank donations - 9:30am to 3pm on Mondays. Est. 2013, women's group for shared interests, talks, outings & social networking. Updated programme. ◇ Harold Daniels R.I.P. - WCN Chair (2011-16). ◇ Bill Greenhalgh R.I.P. - WMADS. ◇ Pam Clarke R.I.P. - WLHG.